The Catalogue for VeritasTM Enterprise Vault allows organizations to find data at record speeds. 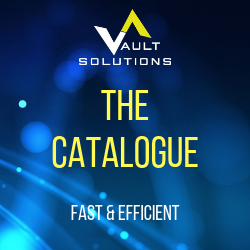 Using the Catalogue, a single query can be done across an entire Enterprise Vault environment in place of what would normally have taken hundreds of searches using the built in Enterprise Vault search engine. The Catalogue is an enormous benefit for many applications, indexing the metadata of messages. This is a way to take the strain off the Enterprise Vault indexes for certain classes of inquiries. Designed to handle billions of emails, the Catalogue can itemize all messages even in environments with multiple Enterprise Vault servers. Currently incorporated in the Archive Accelerator Enterprise Search application, The Catalogue is automatically used in many searches that can be accomplished without a full text index. Doing so makes some of the searches go over 10 times faster than before. 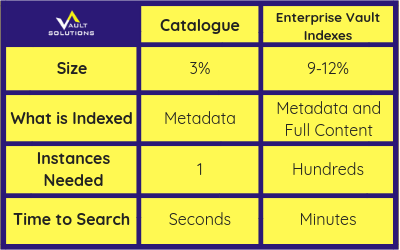 The Catalogue can place legal holds on data in Enterprise Vault more than 50 times faster than using Discovery Accelerator. Of course, Discovery Accelerator should still be used when the legal holds involve searching the content of messages. When searching Enterprise Vault, there are hundreds of indexes to search through, filled with both email content AND metadata. Part of the speed and efficiency of the Catalogue is that there is only one. So, for any organizations needing a way to quickly search through terabytes of email archived with Enterprise Vault, or a dramatically more efficient way to routinely put email on legal hold for given custodians, the Catalogue can provide a huge advantage.